Ring in the Fly Fishing New Year with Backwater Angler. Stop in a Pick Up a License New Years Day! 2011 will mark Backwater Angler’s 10th year. We’re celebrating by being open on New Years Day to help anglers shake off a little cabin fever and properly ring in the New Year by wetting a line. 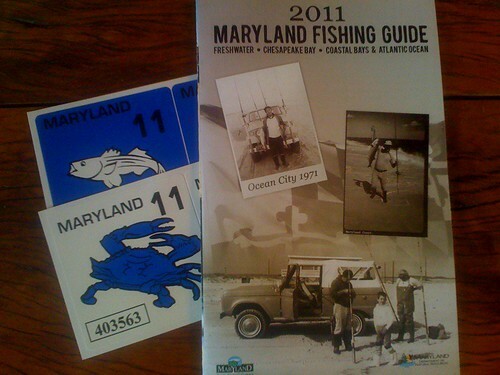 Pictured above is the new MD DNR regulation booklet, Bay Sport Pleasure Boat Sticker and Crabbing Boat Sticker for 2011. Fishing conditions along the river have improved measurably this week. The river is flowing at 29 CFs, is still chilly at 37 F, and should be warming through the weekend. Stoneflies are right around the corner and we should see some black flies and grey midges as the water warms up a bit. Stonefly nymphs with midge droppers have been accounting for a few fish and small streamers dead-drifted are also worth a shot. Be sure to bring a check or cash for license payments this weekend and get out while we get a break from the wind. 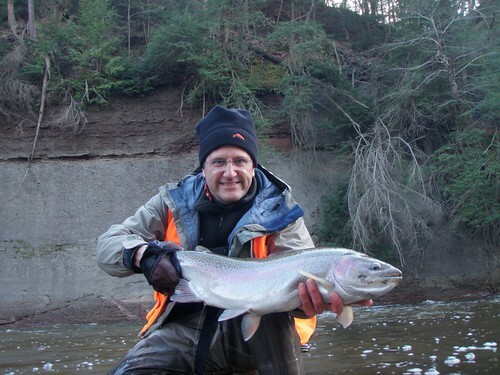 This entry was posted in fishing report, news on December 30, 2010 by Theaux Le Gardeur. 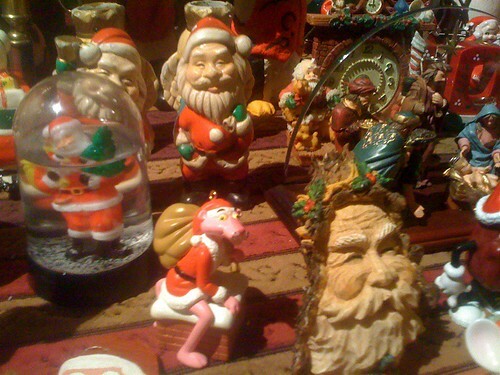 The shop will be open Christmas eve from 10AM till 4 PM. 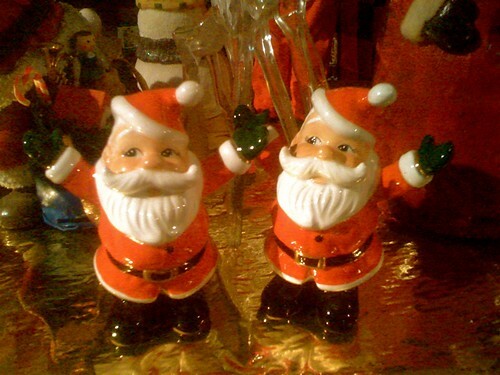 The shop will be closed on Christmas day. The shop will be open Sunday from 10AM till 4PM. If you’re windblown and still wondering about what to get the fly fisher on your list and have a VISA or M/C handy, fear not, for EMAIL Gift Certificates, redeemable for gear, guide trips and instruction are available for delivery until 2:00 PM Eastern on December 24th. You may also call us with your email info at 410-357-9557. Cheers! This entry was posted in news on December 24, 2010 by Theaux Le Gardeur. The Gunpowder river is flowing at 30 Cfs, is 37 F and clear. Until the wind knocks down, try swinging small stonefly nymphs toward the banks. Traditional streamers are also worth a shot. Try dead-drifting them in the log jams. The river has been low since early fall so one will find fish along edges in leaf litter and tucked in the deepest slots they can find. Now would be a good time to explore the lower river between Bluemount Rd. and Upper Glencoe Rd. 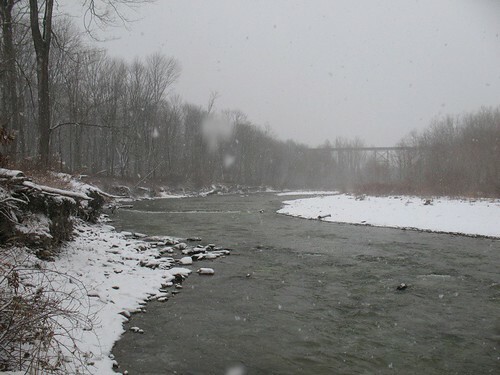 It’s a big area, the fish are spread out, and hiking the NCR trail will allow you to warm up between likely spots and check out some scenery along the way. In the catch and release area, access points that allow one to fish the river where it narrows a bit might be more productive than the flats from Masemore to Bunkerhill. There are still quite a few Redds out there so watch your step and use the trails to get to the areas you’d like to cover. It’s cold out there! During sweltering summers down south we say it’s not the heat, it’s the humidity. For the better part of the this December we’ve been saying it’s not the cold, it’s the wind along the river. 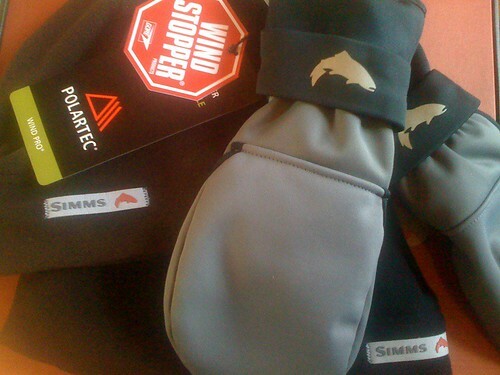 To that end we now have Simms Windstopper® Fold-Over mitts and Freestone fleece fold-over mitts in stock. We’ve also added some Merino wool wading socks from Simms. A recent fishing report from earlier in the week is pointing to stoneflies on the horizon. Good to see you yesterday and how great it was to finally wet a line. After a long week of moving into our new home, a day on the Gunpowder was exactly what I needed. My favorite thing about winter fishing is that it keeps most other people away, allowing a rare time to be truly alone on the water. It was cold and windy, whereas my purchases of the Simms windproof fleece hat and gloves were validated, as they both did a great job keeping me toasty. Two nymphs, two and a half hours, and 3 fish later I called the day a success and left to return some feeling to my extremities. All three came from nymphing small black stones through deeper riffles. A beautiful twelve inch brook trout really made my day and made the effort worthwhile. I sometimes wonder why more people don’t fish in the winter. I mean, fish don’t hibernate, but some people sure seem to. All the better though for some as well. This entry was posted in fishing report, gear, reviews on December 24, 2010 by Theaux Le Gardeur. The past two months I’ve hiked the Gunpowder (almost) top to bottom looking for spawning activity to film. I watched as redds began to appear nearly overnight along different sections of river. On a few occasions I was fortunate to witness numerous browns in the process of spawning. I watched two big trout pair up on a redd and spawn, before vacating the area days later. One day I filmed as many as eight to ten browns competitively jockey for position next to a female, and bump her to drop eggs. I also filmed some large browns that moved from their hiding spots to spawn in the shallows. I already traded the rod for the video camera in hopes of getting some good footage, and allowing nature to take its course. In the shop we urged anglers the past two months to use caution when wading, and avoid fishing to trout on redds. The New Year is fast approaching and the majority of browns have moved off their beds into their Winter lies. Although the redds are now empty, the clean gravel beds still contain fragile eggs, so anglers should be careful not to wade through them. 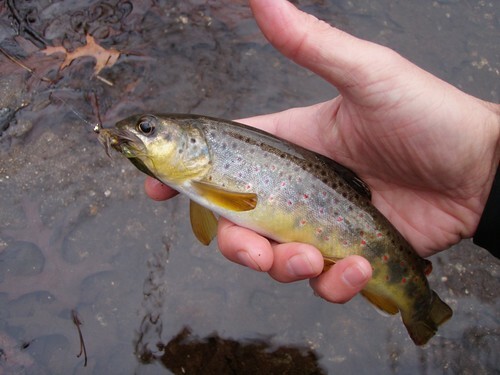 In this video post I filmed browns in the process of ensuring the future of wild trout on the Gunpowder River. This entry was posted in fishing report, video on December 21, 2010 by Jason du Pont. Thanks to Mitchell for the great pics and report. 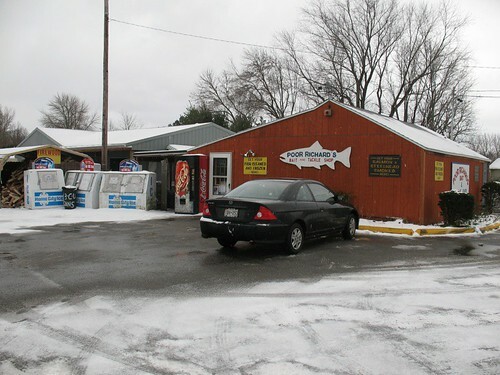 I always enjoy stopping in your shop when I’m in town visiting my sister Diane and her husband Stuart Pelkey who doubles as my fishin’ partner. Your shop has a great atmosphere and your warm hospitality is much appreciated! The Gunpowder is an awesome river, very scenic and rich in wildlife. It’s great fun casting to those browns with a four weight in hand. This past summer we had great luck drifting dry flies and over thanksgiving streamers were the ticket! A bead chain olive wooly bugger that was a bit neglected in my box brought frequent strikes.My passion is fishing for steelhead with a two-handed rod and I employed the same down and across swing that I use for steelies. In the low clear water conditions I targeted areas with a broken water surface and structure. I often tried to position myself to allow the swing to end in the “dangle” right in front of the structure. Great fun! Attached is a pic from my recent trip to the Gunpowder and a nice steelie that caught shortly after my return to Ohio. Browns in Baltimore and steelies in Cleveland! If you didn’t know better you would think that I was talking about football! Happy Holidays to you and the rest of the crew at the Backwater Angler! ps Look me up if you ever in Ohio and want to chase some steelies. This entry was posted in fishing report on December 20, 2010 by Theaux Le Gardeur. Thanks to Mike for the glowing Simms product review. Christmas comes early in Virginia-or so I’ve heard. …Thanks much, Theaux. I appreciate it. On another front, I christened the waders and boots today. Wow…great gear. Re the waders, air temp was 36F, and I imagine water temp was about the same. I had a pair of mid-weight Simms long johns (probably the predecessor to the current RiverTeks) and lightweight wading pants on under the waders…and I was quite comfortable, even a bit warm at times. As you may recall from my e-mail to you after I tried them on, I said that they were certainly a vast improvement over the originial G3 Guide stockingfoots, which I was replacing after 12 years. My initial evaluation was confirmed by today’s christening. I love them. The boots are great as well. With the star cleats installed, they outperform the Chota STLs with cleats substantially. I did have to slightly widen my wading stance for some reason–perhaps because I was still adjusting to the different feel–but I love them as well. This entry was posted in gear, reviews on December 18, 2010 by Theaux Le Gardeur. It’s cold out there but this offer will warm your heart and keep you looking fresh and feeling fiscally responsible. That’s right folks, spend $150 or more through this Friday, December 17 and get a free Backwater Angler T-shirt on us-while supplies last. We can’t change the weather but a free shirt might just change your luck. This entry was posted in news on December 15, 2010 by Theaux Le Gardeur. 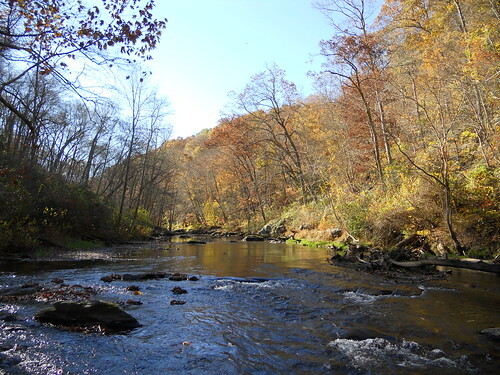 Thanks to Mick for the stream report and Pics from Elk Creek. At our counter you’ll often hear, “new gear is lucky gear,” –the mantra rings true again! I finally got the chance to test the 8 wt. St. Croix Imperial and Lamson Guru combo you set up for me on my first Steelhead adventure. I spent a day and a half on Elk Creek near Erie, PA last weekend. After checking in at Poor Richard’s for local advice, flies, and tips I hit the water and spent Saturday working on technique, learning the water, and watching locals pull fish out. On Sunday it got a little colder, the wind picked up, and snow came down hard. Close to giving up for the trip – cold feet, ice on the rod, slush in the water, flies lost on the bottom; I tried one last drift. The indicator slowed for just a bit & I pulled the rod back. For about the 6th time, the rock I was obviously stuck on moved a little and here we go! This time the set was good and after some tough work I had my first Steelhead. I executed a quick CPR (catch-picture-release) and called it a day. Fun times on new water. But I’m looking forward to getting back on the Gunpowder. See you at the shop on the weekend. This entry was posted in fishing report on December 15, 2010 by Theaux Le Gardeur. The gift giving holidays are fast approaching and many angler’s spouses, families and friends are asking us for holiday gift ideas. A high demand item this year is Simms Vibram Soled Wading Boots, since a ban on felt soles in Maryland is a real possibility. The Simms boots have proven more effective at gripping rocks than most anglers expected from a rubber sole. 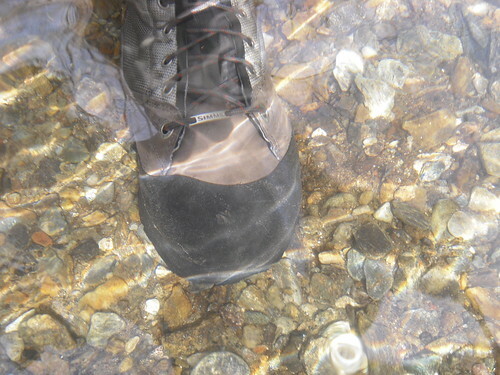 In regards to traction the Vibram sole got solid reviews from anglers in all types of terrain. The shop worked a number of the new Simms Boots into the guide service in 2010, and even first time anglers (and first time waders) on guide trips moved with confidence. The shop has a number of styles and sizes in stock for the holidays, and will also have more boots arriving on pre-season orders through Spring. A gift certificate or pre-paid purchase for a pair of Simms boots will ensure availability of a preferred boot style and size in the coming months. Don’t wait until Spring, since these boots can be difficult to get if certain sizes and styles sell out! Another good gift idea is a net from Blue Ribbon Nets. These nets hand crafted in Bozeman, Montana are both functional and built by talented wood workers. The nets in stock have a variety of hoop sizes and handle lengths, in addition to some with rubber bags. The wood used on these nets is ash/cherry or walnut/ash with a high gloss finish. This entry was posted in gear on December 7, 2010 by Jason du Pont. It isn’t too late to get some fishing in before 2010 is over, and it isn’t too early to pick up a 2011 fishing license. In order to write a fishing license we need a current driver’s license, and check or cash for the license sale. An early reminder for anyone fishing after the holidays, the shop will be closed on New Years Day. The first day of the year is a popular one for fishing, and also forgetting that after the stroke of midnight last year’s license is no longer valid. Now is a perfect time to get ready for next season. This is also a good time to find some last minute gift ideas to pass on to family and friends. This entry was posted in news on December 7, 2010 by Jason du Pont.